How many men do you know named Wilbur? Probably not many. But if you lived towards the beginning of last Century, you would have been much more likely to meet someone by that name because between 1880 and 1930, the name Wilbur was much more popular than today. In fact, according to babynamewizard.com, about 1000 babies out of every million born in 1919 was named Wilbur. While we cannot know for certain, the name was probably popularized by people wanting to commemorate the work done by Wilbur Wright – one of the Wright Brothers. The same holds true for the name Orville. 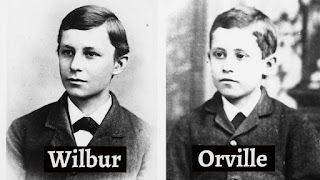 While you can probably live your life without meeting anyone named Orville, the name was much more popular back at the turn of the last Century, peaking in popularity around 1910 when roughly 550 out of every million babies were named Orville. This argument is an old one from my original website Doxa, But Skeptical walked right into it by putting himself in a position to make the beginning of time an issue, Here's how it was set up. "I just told you why God can be eternal and nature can't be, Nature is time bound and caused and God is eternal; and is the basis of reality,God is being itself ... because it;s time bound (remember the big bang) of you want to say laws of physics are self sustaining and eternal you are basically cantilevering them to status of God.you are not an atheist, you are a scisentismist, worshiper of science"
(3) The Universe Displays a Law-like efficiency and dependability in the workings of it's natural machinations. (4) Such efficiency and dependability is indicative of mind as ordering principle (from 1,3), therefore, it is logical to assume mind as the best explanation for the dependability of the universe..
(5) A mind that orders the universe fits the major job description for God, Thus mind is the best explanation, assuming the choices are mind vs random chance. He spends a lot of his time writing lies about my work. He didn't have the guts to show me the list until it was a mile long. Here is one of his piles of drivel. Joe HinmanMarch 16, 2019 at 8:25 AM I an Joseph Hinman I did the interview in question. I want ayone who reads this to realize taht "I am skeptical" does not know anything. He is not a scholar, he's never been to graduate school He;s not published, he doesn't read most of what he criticizes,I doubt he read the interview. I argue with this guy every day on my bogs. He is trying to get at me because I've beaten him so many times. The one thing I know from arguing with him is that he does not read anything he criticizes. - Joe, most philosophers agree that the existence of God CANNOT be proven. Did you ever ask yourself why? You can only prove God if you make certain metaphysical assumptions. If you do, then the existence of of can logically follow from them. But it is not necessary to make those assumptions. Therefore, the existence of God cannot be proven. This is what philosophers understand, but you completely fail to understand.